Some pictures from my trip with Ben to the Turkish border last week. 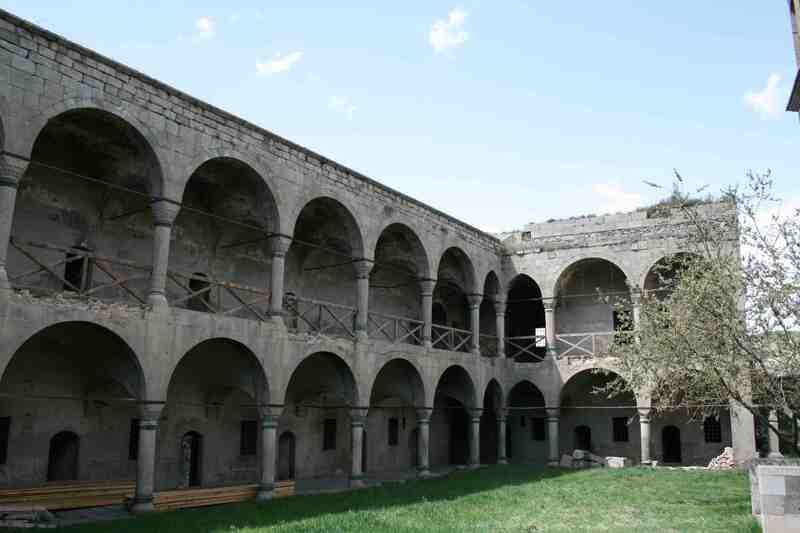 It was time to renew the visa, so we took a marshrutka to Akhaltsikhe, and from there a taxi to the border with Turkey. We had arranged to meet at Didube, from whence the buses leave, at 7:30 so we could get the 8 o’clock marshrutka, but Ben had been out drinking the night before, so naturally he was late. I pleaded with the driver in broken Georgian, but marshrutkas are surprisingly punctual. So instead Ben bought me breakfast at a nearby cafe (he arrived about ten minutes after the marshrutka left), and the we took the next one an hour later. At Akhatsikhe we got a taxi, a tired Lada (though dashboard indicators were all in English) that took us through the crumbling village of Vale, along the ramshackle barbed-wire fences marking the unusually large no-man’s land between the two countries—with a number of watch-towers dotting the landscape—which had previously been the border with the Soviet Union. The driver had grown up in the area, and related how life had been much easier in that period; he waved at the fences and watch-towers with a sort of resigned wonder, and remarked that within ten years they will probably have decayed. He had several children, all of whom still lived in Akhatsikhe. One or two of them had been to Tbilisi, but couldn’t find work, and so were now back. The border was more or less completely empty, so we didn’t need to wait long. The second guy on the Georgian side who checked our passports seemed happy to see us, and stalled us with friendly questions about where we were from, what we were doing in Georgia, whether we liked it, etc. Must be an insanely boring job; it looked like very few people use this crossing. Once I got my passport stamped, and Ben got his visa, we walked around 100 meters into Turkey, turned around, and went back. The Turks seemed amused that we were already back, smilingly stamped our passports again, and let us through. On the other side our driver was waiting for us, and took us back to Akhatsikhe. A short walk from the bus station is Rabati, the ‘old town’ nestled around the hill on top of which sits the large old castle. 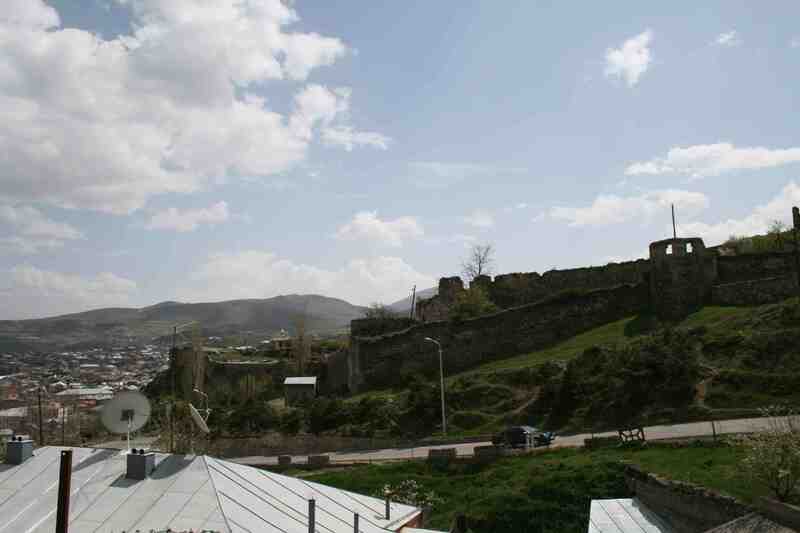 “Akhaltsikhe” itself means ‘new castle’, but it’s been there since the 12th century. 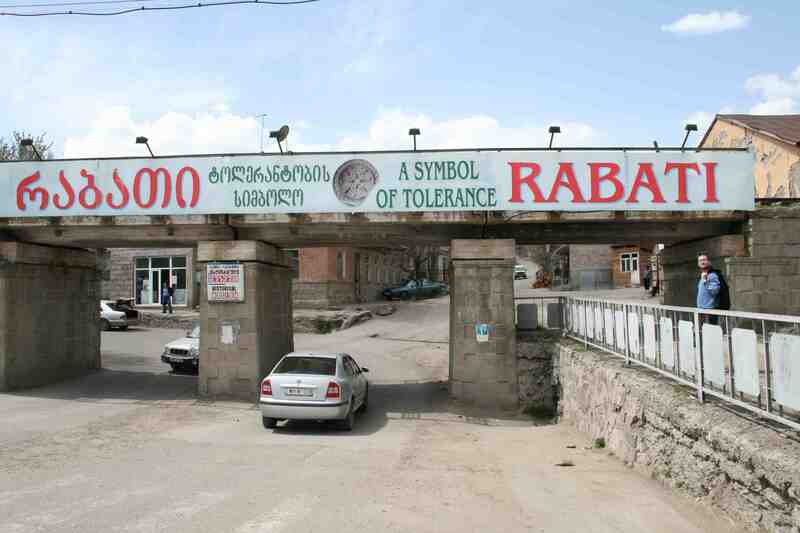 Not sure why the banner proclaims the area as a ‘symbol of tolerance’; from 1688 until 1828 it was the centre of a pashalik (an Ottoman administrative area goverened by a pasha), so perhaps it has something to do with that. The parts that we saw—other than the castle itself—were exclusively residential, so there wasn’t much to see. Climbing up the hill towards the castle. The town spreads out to the left. Near the entrance of the castle. 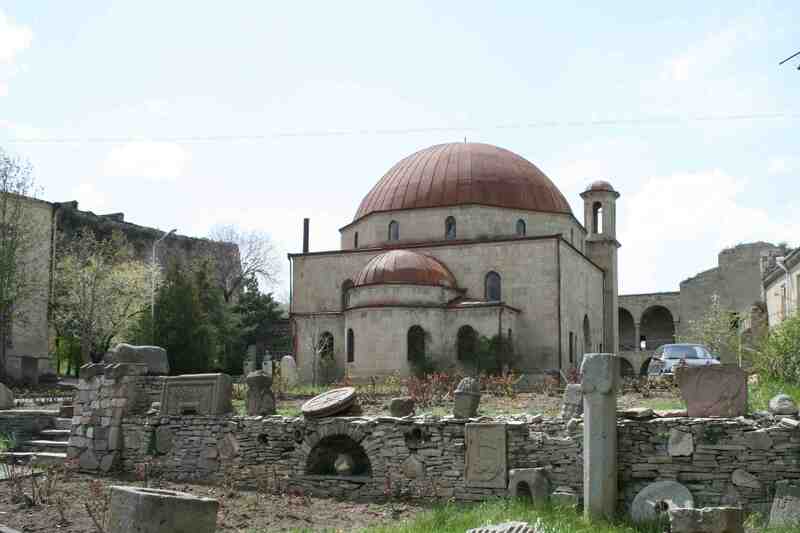 That dome in the background belongs to the mosque that was built there in the mid-18th century. The mosque inside the castle. The castle was a pleasant enough place. It was evident that they’d made some effort into making the place look presentable and interesting, but there wasn’t really much to see. In order to walk around, however, we had to purchase tickets to the Ivane Javakhishvili Samtskhe-Javakheti Historical Museum, four relatively large rooms on two floors housing a collection of bronze-age, iron-age, and medieval artefacts. My trusty Lonely Planet mentioned that they also have a 16th century manuscript of Rustaveli’s Knight in the Tiger Skin, as well as a large collection of Caucasian carpets, but when a stroll through the exhibits failed to locate it, the woman who accompanied us told us that the manuscript had been removed because it had become too fragile, and the carpets were being cleaned. Inside the mosque, now an extension of the museum. Most of the stuff on display inside the mosque seems to have been grave-stones or blocks of masonry with inscriptions on them in Georgian or Arabic. Many of them were quite simple and quite personal—“Giorgi asks the Lord to forgive him”—rather than the common grandiloquence rulers inscribe on their buildings. The main part of Rabati? From the castle there’s a nice view of what I presume is the main part of Rabati, on the other side of the hill from the centre of Akhaltsikhe. We didn’t have time to visit it, but it looked quite pleasant. 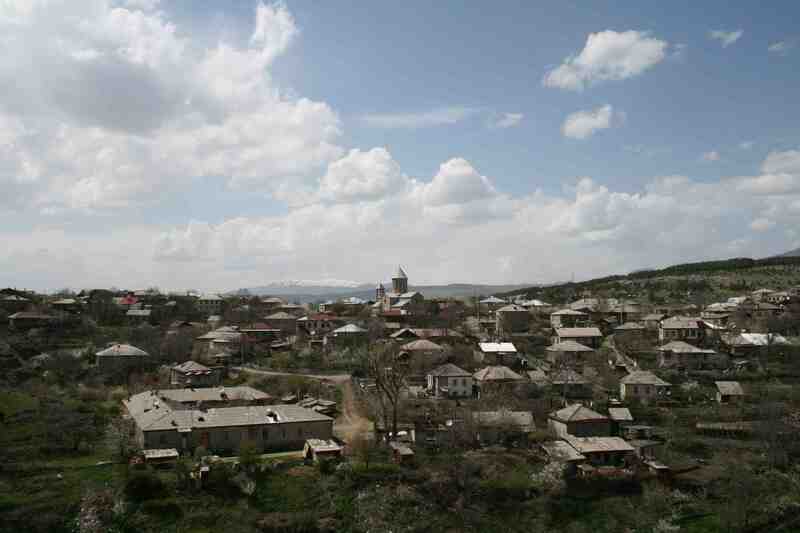 Indeed, as Georgian towns go, Akhaltsikhe was relatively agreeable: not as broken down, decrepit, dirty and dispirited-looking as some of the more dejected post-industrial communities one frequently sees. I occasionally think, while passing through various towns, that with a little effort on the part of the inhabitants the towns and villages could be made to look a good deal nicer, and I often wonder why no one does anything about it. 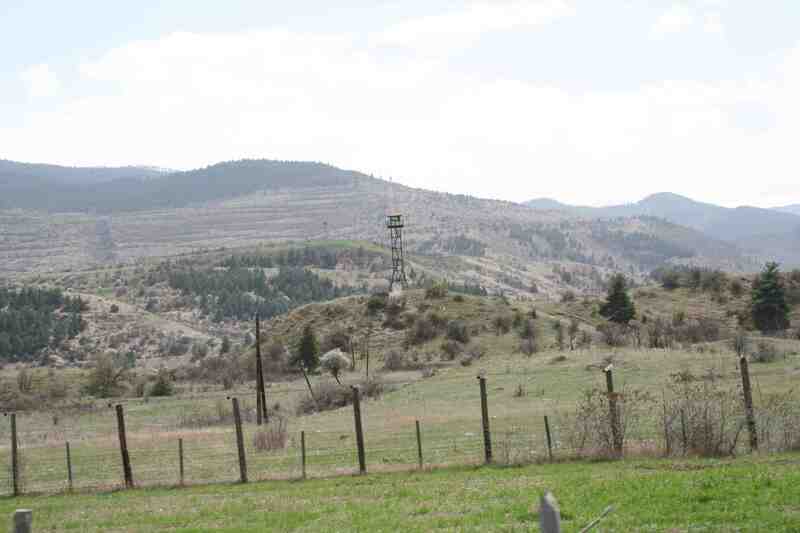 On the marshrutka ride, for example, through the lovely mountainous area between Borjomi and Akhatsikhe, one sees clusters of houses creeping up the beautiful green hill-sides, the view disfigured by numerous trash dumps: it seems that the villagers simply dump their trash between houses and let it fall down the hill-side. Similarly, one often sees buildings crumbling to pieces, empty lots filled with the decaying remains of cars, trucks, miscellaneous mechanical equipment, more trash. Again, a very little collective effort would remedy matters considerably. 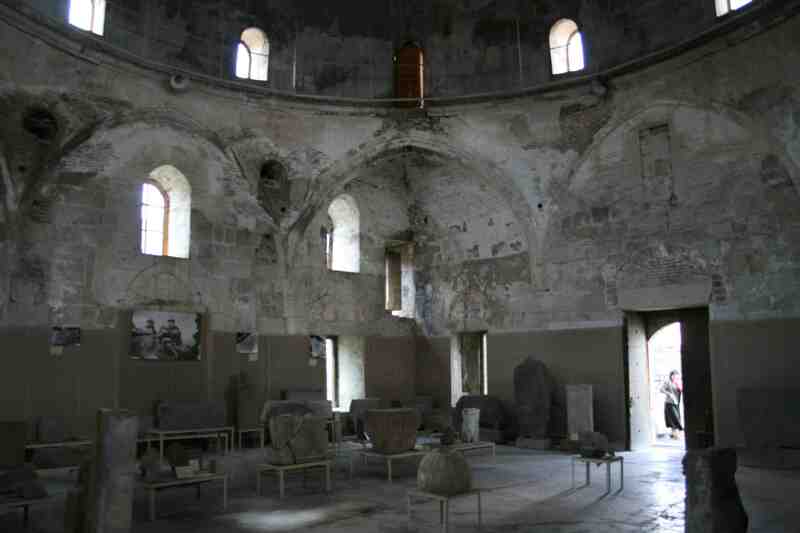 Akhaltsikhe is less woeful than a lot of other towns I’ve seen, and in fact there is evidence that efforts have been made at least with respect to the central square, where the main church is. 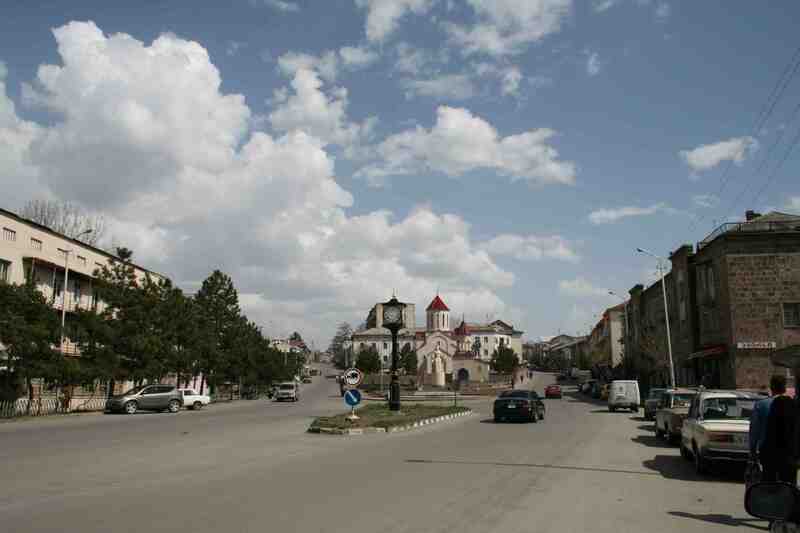 The main square, with Kostava Street to the right. As Ben and I were walking up the street here, a group of older men stopped us and started chatting to us. One man in particular took an interest, and told us about the history of the city and its sizeable Armenian community (he was of Armenian descent). His father’s family had apparently left their hometown in Armenia, now part of Turkey, before the war and the genocide, while his mother’s family had come as a result of the genocide. 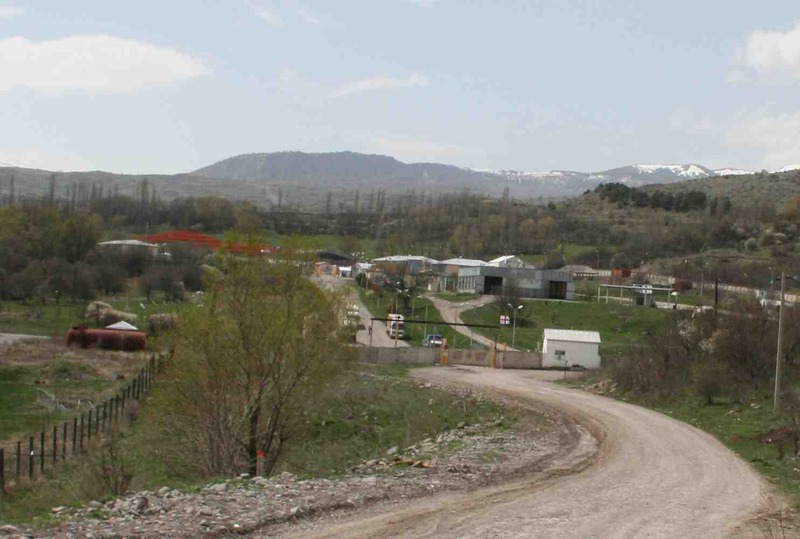 He accompanied us a couple hundred meters to one side of the main road from which a large church was visible; he proudly indicated it and told us it’d been built by Armenians before the genocide had sparked the diaspora. After a brief walk around town, we went back to the bus station on the other side of the river, found our marshrutka, and headed back home. The Lonely Planet guide writes that it’s a four-hour trip between Tbilisi and Akhaltsikhe, but we made each legs in a few minutes over three hours, though it’s true that the drivers were absolutely crazy. As I’m sure I’ve mentioned before somewhere, marshrutka drivers are well-known for being insanely reckless—or perhaps daring—drivers, swooshing in and out of traffic at high speeds, overtaking on blind corners, squeezing past trucks as oncoming traffic roars by, half on the shoulders of the road. This seems quite normal; if the driver doesn’t manage to completely overtake a car or truck by the time cars arrive from the other direction, everyone simply squeezes together as much as they can to allow this informal three-lane system without so much as a warning honk. It’s one of the things I’ve noticed in Georgia, that disorder and not following the rules doesn’t bother Georgians, it’s simply part of the landscape that one has to navigate. Usually, the honking provoked by erratic driving is not so much an annoyed “Hey! What are you doing! Stay in your lane!” as would be the case in Europe as a simple device to let the wayward driver known one is there. I think I’ve remarked before that in multi-lane streets in Tbilisi, the drivers seem to navigate as much by aural as by visual stimuli—a sort of modified echo-location by which drivers alert others to their position while pursuing their course of least resistance, completely irrespective of the rules of the road. Generally people don’t seem to mind, and simply conform to the chaotic flow that always threatens to get out of control, but miraculously usually doesn’t. So a pleasant if uneventful trip; successful in getting our visas in a single day rather than having to take the overnight train to Batumi and from thence to the Turkish border at Sarpi. So I should be set until I head back to Europe this summer. what an interesting report, thanks a lot! i currently live in turkey, but will be moving to georgia in autumn, so i was wondering about the turkish-georgian borders…… so, this helped a lot!